In case you have some money left over, you have time off between October 18th and 21st 2018, you loved to watch Love Boat (a series from the seventies, you have to be that old to know that series) and you’re totally into Rockabilly music… well here’s the festival for you: The Baja Bop. Bands like: Los Straight Jackets, Si Cranstoun, Big Sandy and his Fly-Rite Boys, Ruby Ann, Kim Lenz, D.J.’s and many more, will rock to and fro with you on full sea. Dees Honeytones with Cruisers Rock and Roll club Organizer Cederic. It was an honor to be invited to play on the big 10th anniversary party of The Cruisers Rock and Roll club in Vlamertinge Belgium. Cedric and his friends organized this event, with four bands, 5-o-matics (NL), Dan Cash and the Road Rockers (FR/BE), Tabasco Wild Band (FR) and yours truly Dee’s Honeytones. Also enough stands to buy your clothes, records and accessoires and very important dj Gegene! We made some new Belgian and French friends. The cruisers members are like one big family. Everyone helped to make this event a big hit. The bands got a warm welcome. Also nice to watch the other bands. We had a great time at Franeker Rock and roll Festival. The sixth edition of this annual festival had two small stages and a main stage throughout the city center of Franeker (Friesland, The Netherlands). The weather was rough, windy, rainy, but as we kept on rocking and rolling on the outdoor stages, we kept ourselves warm. Earlier this year I visited the First Scumbash in Rotterdam The Netherlands. I already wrote about it back then, http://www.rockabilly-online.com/?p=10749. But now I realize I forgot to tell you about the main event of the whole day. First let me refresh your memory: The men of Schorem, Haarsnijder en Barbier have been in the Dutch media a lot lately, being one of the few vintage styled barbers in The Netherlands. Clients lining up in front of their shop, they don’t mind waiting for one or two hours. Women are not allowed in, dogs are. Men with beards and moustaches everywhere, with the greasy haircut. Even at the university, grocery store, shopping mall. They’ve shot the hype into the mainstream world. Barbers loving the vintage style of the thirties forties and most of all music! 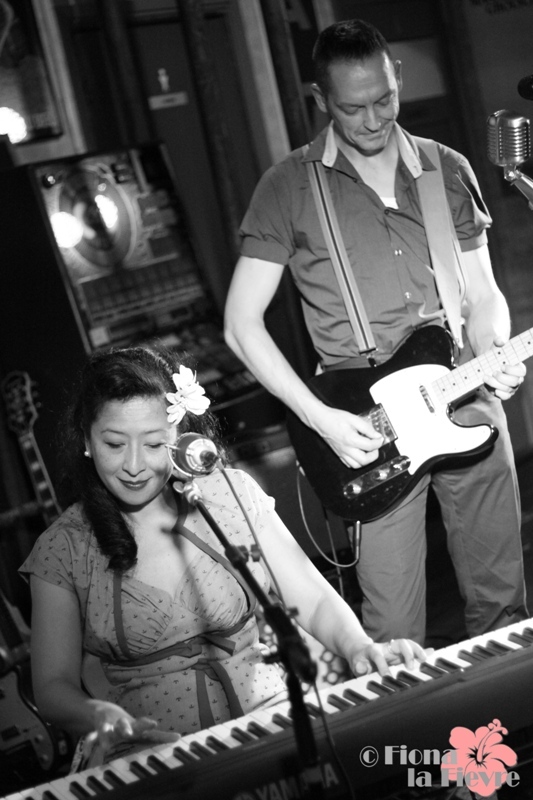 We’d love to introduce you to some of the bands that you will see at Rockabilly Rockout! Viva La Grasa is Alex Tapia (left), Oscar Reyes (center), and Daniela Reyes (right). We are a small Texas based promotion company with over 15 years of experience combined. We have a passion for roots Rock N Roll, Rockabilly, and the culture that comes with it. This all started with a vision of putting together a show that hadn’t been done before in San Antonio, TX. We wanted to give an opportunity to our friends to see bands they normally wouldn’t be able to see as well as an opportunity for the bands to play for a different audience. We have two goals for Viva La Grasa, for everyone to have a good time and to be able to do this every year. “Home” is a concept that is both solid and nebulous. To many, home is the city where you currently reside, the plot of land you call your own, or simply the bed where you lay your head. These concepts of home are all true. But then there is “home” as a place of origin. The space that helped shape who you are. In the United States, this often brings to mind lots of Norman Rockwell imagery of simple, small town life and all of its nostalgic charms. As the setting of this story is my hometown of Graham, Texas; located in Young County, not far from the infamous Possum Kingdom Lake. And as we made our trek from Austin, my home for the last five years, those feelings of nostalgia started to trickle in and by the time we drove through Mineral Wells, were simply overflowing. For the first time in my adult life, my past and my present were locking horns in a fury of anxiety and excitement. I first became aware of the “Cars and Stars” event through Facebook. Local Rockabilly/Alt-Country act, the Octanes played the show in 2013 and the pictures of my old town square drew me in like an old hound dog to a soup bone. If you had told my teenaged-self that there was going to be a festival with Rock ‘n’ Roll bands, hot rods, and pin-up models in my humble and conservative hometown my younger self would have no doubt scoffed in disbelief at the notion. But there it was, clear as day and it set my brain on fire. I had to see this for myself. Then lightning struck and I knew. Danger*Cakes, my wife, Jamie’s band needed to get in on this festival. Nothing would make me happier than to see them play at the town square where I had spent so much of my childhood. I had to make this happen. Fast forward almost a year later to April 11th. Jamie, the band, and myself were all packing up late Friday night for a four hour drive through the Texas hill country. My mood was electric and the night was just chilly enough to have that atmospheric quality. By the time we finally rolled into Graham around 1AM, the town seemed empty, reminding me of the many misspent nights roaming the town streets with my friends, often ending up at the local cemetery, if we felt brave enough. Although this night my gang of friends and I simply ended up at the local Holiday Inn, a relatively new addition to the town. The Lonestar Roundup this year fell on a very special weekend for me. It was my second wedding anniversary. My wife Jamie and I spent the tail end of our Honeymoon seeing Wanda Jackson play at the 2012 show. We opted out of the 2013 show, but this year marked our return to the realm of fast cars, loud music, and big hair. It was a return with a kick like a kangaroo. l friendly and familiar faces. Since 2003, Amsterdam BeatClub is one of the prominent organisations in The Netherlands for promoting the great 50’s/60’s music. Such a great atmosphere at Hotroddedbullfrog a festival that started in 2011, attracting 900 rock and roll fans to six cafe’s. In 2012 the amount almost doubled. This year Seven Rock and roll/ Rockabilly bands in seven cafe’s. C.C. Jerome’s Jetsetters, Vibro Kings, The Tinstars featuring Little Esther, The Taildraggers, The Hi-Tombs, 68 comeback and Dee’s Honeytones. We got a warm welcome by Carla and Cor the owners of Café de schouw, a very cosy place where they usually play Rock music as Cor told us. With d.j.’s and occasionally bands. I was planning on visiting Esther, but we were on a time schedule and played at the same time. It was raining so even during the breaks we didn’t get the chance to do a quick run to eachother, because we don’t wanna mess up our “wigs” as Esther said in a whatsapp message, haha.